Its been a long time since I made a post on wordpress, specifically a ‘review’. My last review about Dell Inspiron 1525 is still fetching me close to 50% of the traffic I get every day in my blog. So here’s something to add up, my new Nokia E63 mobile. Actually, its been 4 months since I bought it, but well, nevermind, its still new to me! 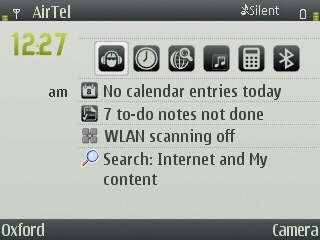 I’m really really impressed with my Nokia E63. Needless to say, its an ‘E’ – series class, which explains it all. Its actually made for business-minded people who use their mobile phone as their personal organizer, calender, emailer and lots more. But nevertheless, it has great features better than most of the ‘N’ – series mobiles, which makes it even more popular among normal users. Following the protocol, I will first point out the Pros and then the not-so-significant Cons of E63. 1) It is a smartphone with a Symbian OS v9.2 ( the latest one being 9.3). So, what exactly is a ‘smartphone’ ? As the name tells, its ‘smart’ and you have to do very little to convey your intentions to your phone. For something which will take you 10-12 button clicks in a ‘non-smart’ phone, may take you just ‘2-3 clicks’ in a smart one! For an example, consider the process of sending an SMS to a friend ‘Jereme’ . I won’t count the message writing part in button clicks.